The sale of the Sacramento Kings is finally complete. The Maloof family announced Friday that the agreement to sell the Kings and Sleep Train Arena to a group led by Vivek Ranadive (VIHV'-ehk rah-nah-DEE'-vay) closed escrow. Ranadive's group acquired a 65 percent controlling interest in the team at a total franchise valuation of more than $534 million, topping the NBA record of the $450 million that Joe Lacob and Peter Guber bought the Golden State Warriors for in 2010. Brothers George, Joe and Gavin Maloof thanked the NBA and Commissioner David Stern for their work in helping complete the transaction. The family also congratulated Ranadive and praised Sacramento Mayor Kevin Johnson and the City Council "for their efforts and loyalty to the Sacramento community." (AP) — A person familiar with the decision says the Sacramento Kings have reached an agreement with Golden State Warriors assistant Mike Malone to be their head coach. The person, who spoke to The Associated Press on condition of anonymity Thursday night because they were not authorized to speak publicly, said Malone was incoming owner Vivek Ranadive's top choice. 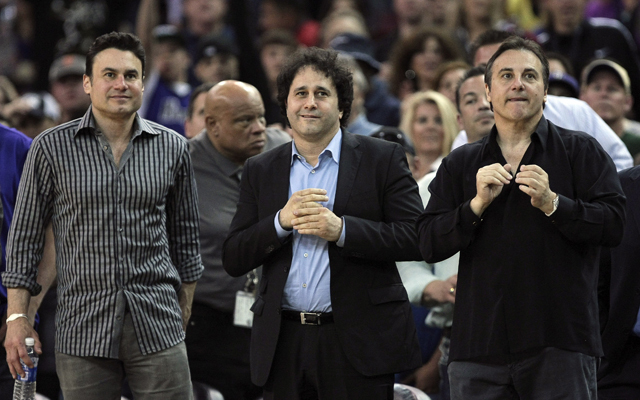 Ranadive has been a minority owner of the Warriors the past three seasons and is closing a sale with the Maloof family to buy the Kings. 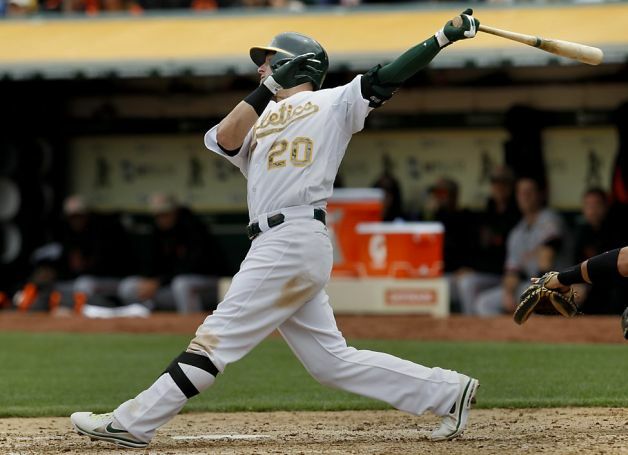 (AP) — Pablo Sandoval hit a go-ahead two-run single in the sixth to help Barry Zito end a six-start winless stretch, and the San Francisco Giants beat the Oakland Athletics 5-2 on Thursday to avoid a season sweep. Brandon Belt doubled in two runs in San Francisco's four-run sixth. Zito (4-3) won against his former club for his first victory since beating San Diego at home April 21. The Giants improved to 7-0 in his home outings and have won 13 straight regular-season games started by Zito at AT&T Park. The game of baseball is easy right now for the Oakland A's. We all know baseball is not easy, but the A's seem to be effortlessly disposing of the competition in near methodical fashion. Last night's 6-3 win over the San Francisco Giants was another win, in a series of victories that has pulled the A's within 2.5 games of first place Texas. Winners of five in a row and 10 of their last 11, Oakland is riding the hot-bat of third baseman Josh Donaldson. Considered a throw-in in the Rich Harden trade to the Cubs a few years ago, Donaldson is making a bid to be an American League All-Star this season. The A's bullpen has been nails. Sean Doolittle is carving up hitters from the left side, while Ryan Cook sets them up and knocks them down from the right side. The enigmatic Grant Balfour has been closing the door enthusiastically in the ninth giving the A's reliability and efficiency out of their pen. Oakland is riding high, and there is no indication that this Athletics team will fade or won't be applying pressure to Texas all season long. Its a different story for the Giants. While their M.O. has been the come-from-behind win it is now starting to catch up with them. San Francisco's ever-fluctuating offensive production is compounded by a lack of consistency from their starting rotation. Matt Cain still has an earned run average above 5 despite pitching better of late. Barry Zito is great one week, bad the next. Tim Lincecum is a slot machine. His strikeouts are up, but so is his change-up most of the time. Madison Bumgarner has been Giants best, but is suffering from a lack of run support in his starts. With Ryan Vogelsong nursing a broken finger, the Giants are having to turn to their farm system, which could help them long-term just to find out what they have. The bullpen has been hurt by the loss of Santiago Casilla as Sergio Romo's set up man. But, Bruce Bochy is piecing it together as he always does. The Giants just need to to survive this rough patch. Their pitching staff ranks 10th in the National League while they have the best batting average of any team in the NL. Which is the aberration ? That will likely determine whether the World Champions are here for the long haul in 2013 or whether a June swoon is on the horizon. Its a familiar refrain. The San Jose Sharks make a spirited run into the post-season. Pull off a great first round win and then come agonizingly short in a decisive Game 7. Two second period goals by Justin Williams were the difference along with the spectacular goal-tending of Jonathin Quick as the defending Stanley Cup Champions move on to the Western Conference Finals against either Chicago or Detroit. Make no mistake, the Sharks had their chances, many of them. But, Quick would not be denied. Glove saves, stick saves, sprawling saves, Quick was amazing. Dan Boyle lit the lamp nearly six minutes into the third period and the Sharks would then apply constant pressure for the remaining 14 minutes. The best chance belonging to young phenom Logan Couture with under five minutes left, but he couldn't control the moving puck and Quick made another save. As it always does the off-season brings questions, but the Sharks have a foundation of youth and veteran leadership along with a Vezina Trophy finalist in Antti Niemi. Even though its familiar Stanley Cup Playoff disappointment, don't expect many changes. The Sharks were a mid-season slump away from being a top-three or-four seed. 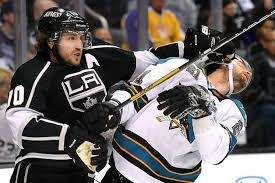 Tough ending for Sharks fans, but they are used to this. They have seen this before and will be back for more in the 2013-2014 season. 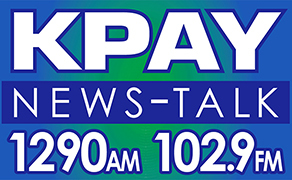 (AP) — Jonathan Quick made 24 saves in his seventh career playoff shutout, and the Los Angeles Kings moved to the brink of their second straight trip to the Western Conference finals with a 3-0 victory over the San Jose Sharks in Game 5 on Thursday night. Anze Kopitar (AHN'-jay KOH'-pih-tar) and Slava Voynov scored, and Jeff Carter added an empty-net goal as the defending Stanley Cup champions won their 13th consecutive home game in dominant fashion. Antti Niemi (AN'-tee nee-YEH'-mee) stopped 26 shots for the Sharks, who have played more than 96 minutes without a goal since they appeared to be taking control of the series midway through Game 4. Game 6 is Sunday night at the Shark Tank. The Golden State Warriors designs on ending their first round playoff series against the Denver at the Pepsi Center on Tuesday night were pushed against by Nuggets....literally. For the first time in the series the Nuggets got physical with the sharp-shooters from the Bay Area and knocked of the Warriors 107-100. Denver's energizer Kenneth Faried, set the tone early by clipping Stephen Curry early, as the Nuggets made sure the Warriors felt their presence on the defensive end. 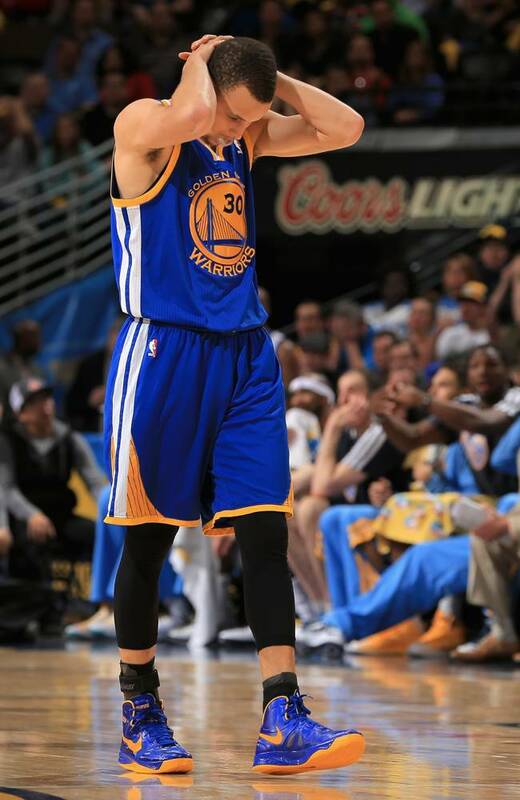 Curry was held to 15 points in the game on 1-of-7 shooting from long distance. The Nuggets jumped out to an early 14-point lead by getting out in transition. That lead ballooned to 20 points at the half and by the late third quarter the Warriors found themselves down by 22. But, the Dubs came scratching back. Jarrett Jack and Harrison Barnes led a surge that whittled the deficit to single digits mid-way through the fourth quarter and with 2:10 to go the Warriors were down 100-95 and had the ball. But, Curry missed a right wing three and Klay Thompson's right corner three moments later rimmed out. The dagger was delivered by the Nuggets Wilson Chandler on the ensuing possesion as he railed a right corner three to put Game 5 to bed. Much of the fireworks regarding these two teams happened after the game as Warriors head coach Mark Jackson told the media that the Nuggets had a "hit out" on Curry and their brand of basketball wasn't just physical but it was dirty. Nuggets head coach was told that Jackson called his team's tactics dirty, to which Karl responded, "did Draymond Green play basketball or football at Michigan State ?" 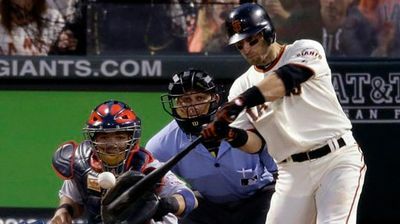 (AP) — Pablo Sandoval hit a two-run homer with one out in the top of the ninth inning and the San Francisco Giants rallied to beat the Arizona Diamondbacks 2-1 on Tuesday night. Arizona starter Trevor Cahill left after allowing a leadoff single to Angel Pagan, the Giants' fourth hit against the right-hander. J.J. Putz (2-1) came on for Arizona and struck out Marco Scutaro, and quickly went ahead 0-1 on Sandoval. But Sandoval drove Putz's next pitch, a hanging split-finger fastball, deep into the right-field stands to give Giants the lead and hand the struggling Diamondbacks closer his fourth blown save in nine chances. It was San Francisco's second straight come-from-behind victory, rallying for a 6-4 win in the series opener Monday. Sandy Rosario (1-0) recorded the last out of the eighth inning for his first career win, and Sergio Romo pitched the ninth for his 10th save. (AP) — Yoenis Cespedes drove in four runs, Seth Smith knocked in three with a bases-loaded double and the Oakland Athletics beat the Los Angeles Angels 10-6 on Tuesday. One night after outlasting the Angels 10-8 in a 19-inning classic that lasted 6½ hours, the A's had a few problems defensively but looked just fine at the plate while beating Los Angeles for the fifth consecutive time this season. 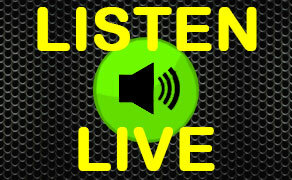 Jarrod Parker (1-4) pitched into the seventh inning and Derek Norris scored twice for Oakland. Mike Trout drove in four runs and Mark Trumbo homered for the second straight game for the Angels. Los Angeles fell to 9-17, the worst start in franchise history. The Chico State men's and women's Track Field teams are headed to Turlock as they get ready to defend their CCAA Championships. Oliver Hanf is the women's Track and Field head coach and interim men's coach while Gary Towne is the men's and women's distance coach. They are both looking for the squads top have another impressive showing against CCAA foes. The men have won an amazing 9 straight CCAA championships while the women have won three straight conference titles.